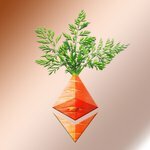 Unless you’ve been in a crypto-free cave for the past week, you might have noticed the crypto-wide market drop. 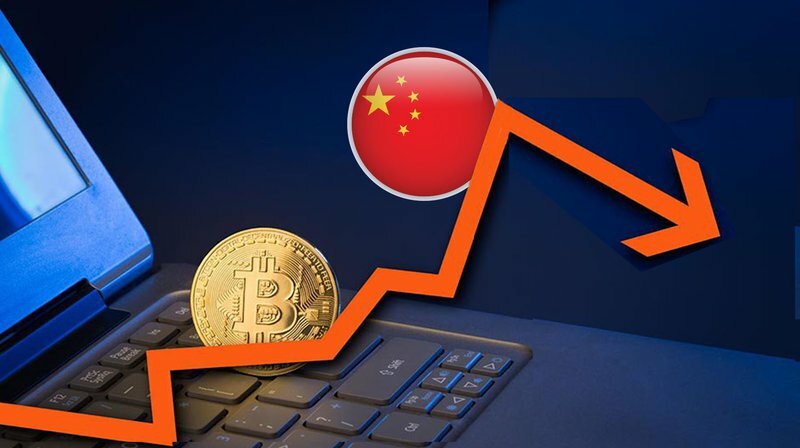 Last week, rumors of China’s crackdown on BTC to fiat transactions began to spread across the crypto-world. On Monday, mainstream news sources such as The Guardian, Forbes, Wall Street Journal, and Bloomberg further supported or confirmed these rumors by releasing articles with the news of a Chinese crackdown on exchanges. According to Chinese state newspaper Securities Times, “All trading exchanges must by midnight of 15 September publish a notice to make clear when they will stop all cryptocurrency trading and announce a stop to new user registrations." Within a day and a half, BTC-USD saw a 15% markdown as the price dropped from $4400 to $3750. After all was said and done, BTC-USD managed to squeeze out one last push before bottoming out around $3000. The bottom was immediately greeted by a strong rally that propelled the price upward by $900. The price shot down, the price shot up — where does this leave us now? Since the beginning of this bull run from $1800, we have established very clear, very strong support and resistance levels along the Fibonacci Retracement set shown above. 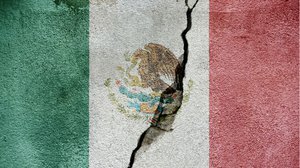 At the time of this article, BTC-USD is testing the macro 38% retracement line where strong, historic support will prove quite tough to penetrate. With such a large growth in such a short period of time, BTC-USD managed to climb about 150% in market value within the span of about a month. Historically, as markets progress through time, they go through phases of accumulation (a phase where investors and traders begin to buy and accumulate assets) and distribution (a phase where traders and investors begin to sell off their accumulated assets). In order words, the market goes up and a bull rally begins, the market begins to top out, and then a bearish rally will bring the prices back down to a comfortable level. It’s a sort of give-and-take in the market as traders begin to place their bets on the future market direction. In our current case, over the last couple months bitcoin has formed a very similar pattern to Distribution Schematic #1 shown above. The above schematic represents one of the possible ways a market can rise, find its top, and distribute assets to market. The nomenclature for this schematic is found here and is vital to understanding the upcoming discussion. While a bearish continuation has yet to be confirmed, the most recent price hike this morning seems to fit the last test of the Wyckoff schematic LPSY (Last Point of Supply). The last point of supply is essentially a false rally where those who didn’t have an opportunity to sell on the previous LPSY now have an opportunity and will begin to sell into the more bullish traders who fall victim to a false breakout. The SOW (sign of weakness) is marked by high sell volume that leads into an AR (automatic rally) where the sell pressure lets up and bullish traders assume a bottom has been hit. The automatic rally is marked by a bullish climb with great ease before finding its top near the previous lines of support shown above in green. The LPSY is most notably described as a series of peaks and valleys on a fairly narrow spread as the bulls and bears exchange positions. During this LPSY, we will expect to see diminishing volume as the market pushes to new highs and becomes more and more difficult. Throughout the length of this small trend, we can see diminishing volume on each consecutive push toward new highs. 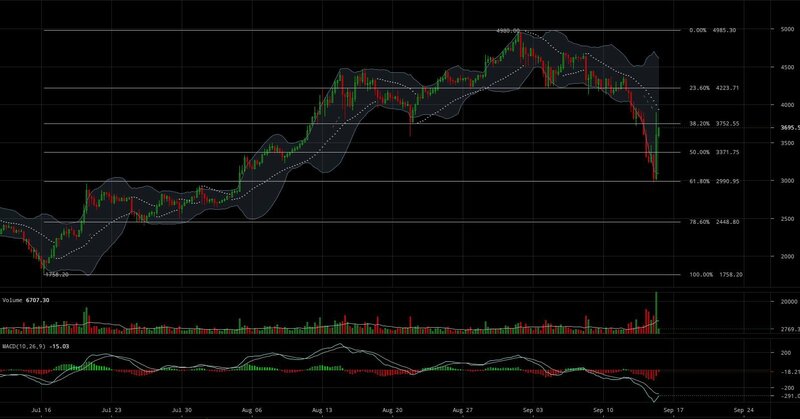 If we manage to continue downward, expect turbulence at the $3000 levels and a possible secondary bounce as the $3000 level offers very strong, historic support. 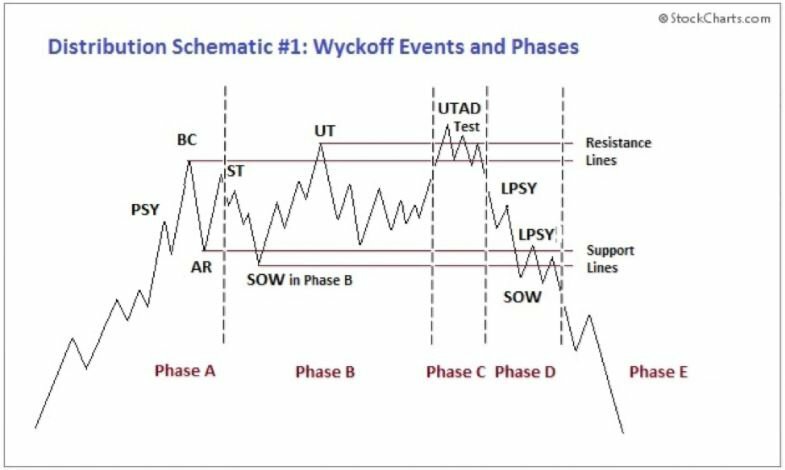 It should be noted however, even though this current trend has a strong resemblance to the Wyckoff schematic, it is always important to confirm the trend before trading it. As with any market, it is entirely possible that this Wyckoff distribution pattern will fail and bitcoin will manage to continue onward and upward to new highs. A market reversal should definitely not be ruled out as the current market trend is showing a strong sign of uncertainty between the bulls and bears. Whether the market breaks upward or downward, always confirm the move with strong volume to support a strong move in the direction the trend. Volatility is to be expected, but we approach the market with a level head and objectivity, seeing the proper positional entries and exits will much easier to spot. Strong, bearish news hit the crypto community this week as China announced harsh regulations on the BTC to fiat transactions on exchanges. 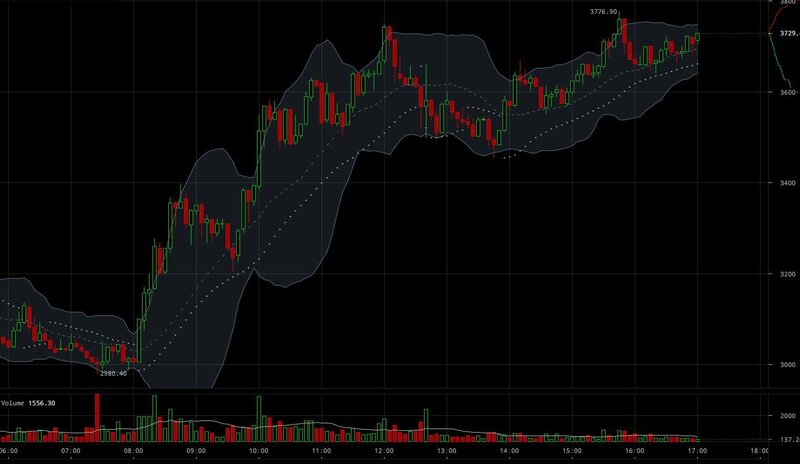 Currently BTC is seeing a strong rally off the $3000 levels but is showing signs of waning strength in the upward direction. A possible macro distribution pattern is unfolding and new lows could be in store for bitcoin over the next few days and weeks.